I had the pleasure of speaking to the students at the Pinecrest School about politics and why young people should vote Republican. The Pinecrest School posted pictures on their website. You can read their article below. 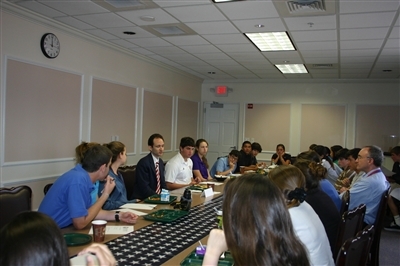 A Look at Election 2012 – Lunchtime Roundtable Conversations put our students at the table with the Chairs of the Democratic and Repulican Parties of Broward County. 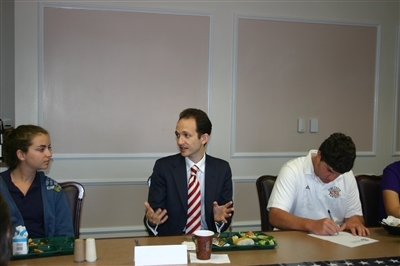 Mr. Mitch Ceasar, Democratic Chair, and Mr. Richard DeNapoli, Republican Chair, shared their personal road to political activism and discussed the issues that frame this year’s Presidential Election. Students learned how important Broward County votes are for Florida and nationally and thus why “getting out the vote” truly matters. Punctuated with a steady flow of questions and answers, these lunch and learn sessions will continue in the fall when our guests return for more lively sessions.